It’s Go4Life Month – Get Ready! Get Moving! Go4Life! September is Go4Life Month — a chance to highlight the importance of regular exercise for healthy aging and to encourage older adults to become more physically active. This year’s Go4Life Month theme is Get Ready! Get Moving! Go4Life! Week One: Get ready with Go4Life! Week Two: Get moving! Do all 4 types of exercise. Week Three: Stay on track to Go4Life! Week Four: Go4Life throughout the year! 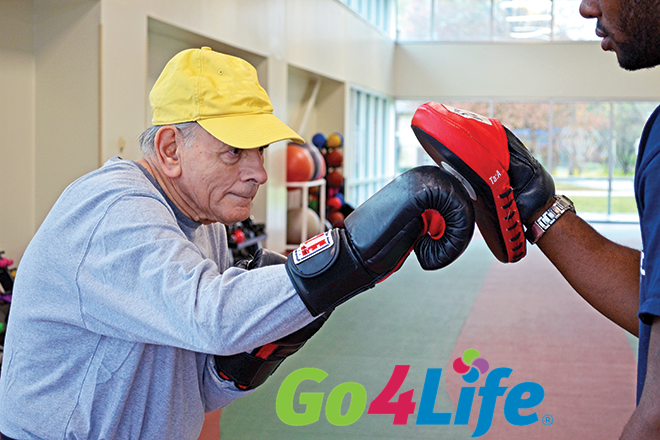 Follow Go4Life on @NIAGo4Life on Twitter and like Go4Life at NIH Aging on Facebook for more daily messages about physical activity and healthy aging. One way to celebrate Go4Life Month is to tune in to the Facebook Live fitness demonstration direct from the NIH campus on Sept. 13 at 2:00 pm EST. The event will showcase the benefits of all 4 types of physical activities recommended for older adults: endurance, strength, balance and flexibility. Get tips from a fitness trainer on how to do the exercises safely and make them more challenging. Hear first-hand accounts from older adults about the many ways these exercises can make a real difference in everyday life as we age. You won’t want to miss this chance get an up close and personal look at Go4Life in action! To join the event, visit www.facebook.com/NIHaging on Sept. 13 at 2:00 pm EST. Move More with the New Go4Life Website! Want to inspire older adults to move more? Send them to our updated Go4Life website, designed to help adults 50+ become more physically active right where they are! They’ll find workout videos, exercises to try, tools to help them stay on track, free exercise resources to order or download, and feature articles on the basics and benefits of regular exercise and physical activity.